Are you a CBSE Student? 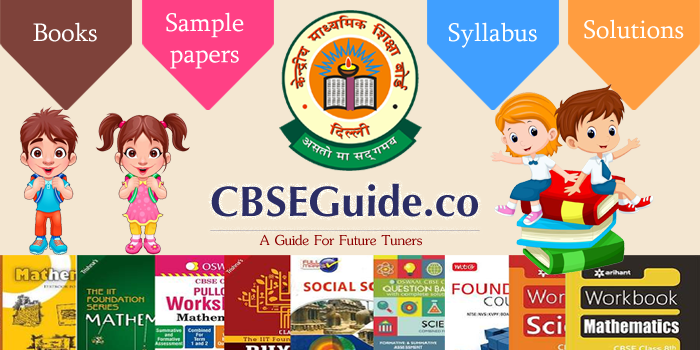 Searching for the CBSE Syllabus, CBSE Books, and Sample Papers? Here is the Solution for all your queries. CBSE Guide is the best platform for all CBSE Books, NCERT Solutions, Syllabus and Sample Papers. Check out CBSE Sample Papers along with solutions in PDF form. You can also Download NCERT Books, CBSE study material, guides, assignments notes, and test papers for Last five years. Now there is no need to carry that large NCERT books, now you can get CBSE NCERT Books pdf along with the solutions. Around 9000+ affiliated schools in India are under the Central Board of Secondary Education. The CBSE Board is the largest governing body for conducting the Secondary and Senior Secondary School Examination in India. CBSE affiliates all Jawahar Navodaya Vidyalayas, private schools and most of the Institutions approved by Central Govt of India. On Every Year of March, CBSE Exam Board conducts the final examinations for Class 10 and Class 12. Get live updates on CBSE Exams from CBSE Guide. CBSE is the most prestigious educational board in India. And it is a trademark for the standard education for all students. As per CBSE Academic Schedules, the Central Board amends syllabus and also add some new topics at regular intervals. So the students can take knowledge help as per their requirements. You can also get the CBSE Sample Papers online for class wise. At CBSE Guide we provide the Class Wise Syllabus for all subjects from Class IX to Class XII. So the students can easily choose the required CBSE sample papers. These papers give students clear perception on essential aspects, which are essential for exam preparation. We at CBSE Guide providing CBSE eBooks in the form of revision books. These CBSE Books will guide the students to understand the concepts and topics chapters better. Hera we upload the important questions of Class 9, Class 10, Class 11 and Class 12 R S Aggarwal, R D Sharma for the new CBSE syllabus for the Academic Year 2018 – 2019. Here you can also get the NCERT Solutions with a complete description of each question in PDF format. As per the student’s suggestions, we daily update NCERT Solution for Class 9 to Class 12. Here You can access a direct Link to download NCERT textBooks and CBSE textBooks online. Refer the CBSE Syllabus 2018-19 for Class 9 to Class 12. The CBSE Syllabus is set by the expertise Faculty of Central Board of Secondary Education. These CBSE sample papers for Class 12, Class 11, Class 10 and Class 9 are designed keeping in mind the latest syllabus and curriculum based on the NCERT. Here you can get CBSE sample papers starting from CBSE class 6 up to the CBSE class 12. Experts suggest that students should practice sample question papers after completion of the entire syllabus designed for that specific subject. Download CBSE Sample Papers for FREE along with NCERT Books. CBSE Previous Year Question papers for Class-XII, Class-XI, Class-X and Class-IX annual and CBSE board exams are available here. In CBSEGuide.co you can download CBSE Sample Papers for all Subject. To download CBSE Previous Year Question Papers for Class 12-Class 9 for the download in CBSEguide.co. The CBSE Guess Papers for Class 9-12 and model question papers and help the student to get better scores and good merit nationwide. CBSE Sample Question papers are recommended to be practiced more and more for the better understanding of Subject, Concept. With cbse.nic.in Sample Papers the students can know the weak areas of students where you need work a bit harder. It helps you to get ready for Preparation exams too. The CBSE Board Exam for the Class 10 and class 12, plays a significant role in framing the aspirations of students and also in the career path. CBSE Question papers play a great importance for the students who have studied in the CBSE class XI, and CBSE XII. To get a good score in Board exams and or succeed in any of the competitive examination students have to solve the CBSE Previous Year Questions thoroughly. So, here we are providing the Central Board Sample Papers for Class IX and Class XII PDF free download links. Solving this Previous, it is more important that you put your best of efforts in preparing for the CBSE exams. The Central Board Syllabus for Class IX to Class XII acts as the most useful learning resource for the Students. Central Exam Syllabus specially prepared by the experts to give the excellent information to the students. And also to make the students up to date on the subject as well as the concept. CBSE Syllabus for Class 10, Class 12 set by the experts in issue, and it is quite beneficial for students. With the help of this Cbse.nic.in Syllabus students become aware of the content and Concepts and the portion to be covered in the examination. According to experts, every student should know the Syllabus of CBSE to start their exam preparation in an effective way. The Students of CBSE should revise their entire syllabus in a thorough manner to get a good score on Board as well as competitive exams. Additionally, with the help of CBSE Syllabus, 2018-19 students can manage their time management skill to improve the exam preparation. The Central Board of Secondary Education maintains a world-class educational standard in all aspects. Therefore, students who prefer to choose CBSE syllabus for learning will take globally exposures to students in terms o the job. The CBSE board prepare the Syllabus by analyzing learning capability of the students and the current educational scenario. Moreover, at regular intervals, the CBSE exam board updates each syllabus accordingly. The CBSE sample papers for Class 10, Class 12 are well-prepared. And the Students of Class 9 to Class 12 advised following these CBSE Question papers to determine their weak areas before the exam. For More about CBSE Regularly visit our site CBSE Guide. NCERT Books offers a strong foundation for students in every concept. These NCERT Solutions will help the students of class 9 – 12 find the correct method to solve each NCERT questions. The significance of NCERT Books well known for each and student. The NCERT solutions are essential for getting on with the practice of the Board as well as competitive examination. Students who are preparing for any competitive or entrance examination, are suggested to learn from the NCERT book. These NCERT Solution for Class 10- Class 12 provides the clear and comprehensive chapter discussion easily. We CBSE Guide provide NCERT Books free download links for free of Cost. Here you can get the NCERT Solutions for all Classes in an easy method. We upload the Chapter-wise and detailed solutions to the questions of the NCERT textbooks with zero cost. Get Free NCERT Solutions for class 9th, 10th, 11th & 12th in PDF format for 2018-19 CBSE Exams. Check out the NCERT Solutions for Physics, Biology, Chemistry, Maths and Physical Education, etc for Class 12 and Class 11. The NCERT books provide a clear cut understanding that will help the student know more about the concept. Students who are preparing for the competitive exams like JEE or AIPMT or NEET get easily stressed with the mess syllabus. It creates a confusion in their preparation and finally they are not able to find out what to learn and what not to. Here is the solution for all that questions. The NCERT Books pdf and the NCERT Solution for all Subject is a gift to the students who waste their time deciding the right book for them. Bookmark our site for more updates on CBSE Books, NCERT Solutions, Syllabus and Sample Papers. For More updates refer us at CBSE Guide about NCERT Solutions and CBSE Board Text Books.